Teaching Kids How to Win with Money! 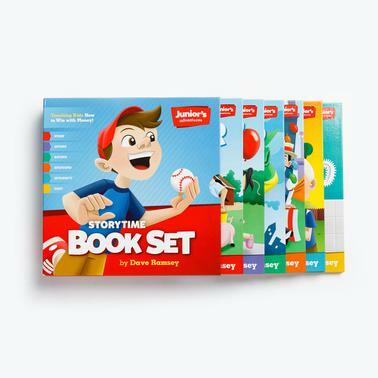 Part of the Junior’s Adventures series, the Storytime Book Set teaches kids the values of hard work, integrity, giving, saving, and avoiding debt. Kids will join Junior as he learns—sometimes the hard way—how to handle money. Junior really, really wants an awesome new bike, but he doesn't have the money to buy it. So, what does he do? He goes to work to earn the money! Join him on his adventure to learn the rewards of hard work. Junior and his friends learn the hard way that it's not wise – or fun – to spend all their money at once. This book teaches children a valuable lesson in budgeting their money and spending it wisely. Find out what Junior's big birthday surprise is and how he learns a lesson about giving to others on his special day. This book teaches children about the many ways to give to others—not only with their money but also with their time. Hop on the school bus with Junior and his class as they take an exciting fieldtrip to learn about money from their favorite cartoon character, Dollar Bill! This book teaches children the benefits of planning ahead for big expenses and unexpected emergencies. When you were a kid, did you daydream about finding a bunch of money and imagine all the things you could buy with it? What would you have done if the money you found actually belonged to someone else? This story teaches your kids the value of doing what is right, even though they may be tempted to do otherwise. When you were a kid, did you ever borrow money from your brother or sister? Did they make your life miserable until you paid them back? In this book, Junior learns that being in debt to someone is not fun! This story teaches your child the value of working for money and the disadvantages of borrowing money.